I can not even tell you how excited my son gets when he sees a new VeggieTales movie arrive at our doorstep!! They are by far his absolute favorite movie to watch on our weekly movie nights and he loves to sing with them, learn a great lesson for life, and hear about great Bible stories! The latest new release from VeggieTales is VeggieTales: Little Ones Can Do Big Things Too. It was inspired by a classic VeggieTales favorite song, "Little Guys Can Do Big Things Too," and these shows let kids know that even though they are small, they can be used by God to do BIG things! This was a perfect lesson for my son because he is a tiny little guy and he especially loved learning about David and Goliath and how David faced his fears and fought against the big guy even though no one thought he could do it. With faith, he did it and we talk about that lesson often as my little guy faces his own fears in life (big slides, dark rooms, etc)! This compilation DVD includes introductions from beloved VeggieTales characters Bob, Larry and Junior, and features the popular Veggie Kids (real kids' voices animated with little veggies), providing their thoughts on everything from how big God is to how little they sometimes feel! VeggieTales: Little Ones Can Do Big Things Too includes popular shows VeggieTales: Dave & The Giant Pickle, VeggieTales Pistachio: The Little Boy Who Woodn’t and VeggieTales: Lyle the Kindly Viking, plus three great Silly Songs (“I Love My Lips,” “Larry's High Silk Hat” and “Where Have All The Staplers Gone?”). The DVD also provides 10 minutes of brand-new animation and extra bonus features! You don’t have to be BIG to do great things. I definitely recommend this new DVD from VeggieTales if you are looking to add to your children's movie collection! Buy It: You can purchase VeggieTales: Little Ones Can Do Big Things Too for $9.99 from Amazon.com. 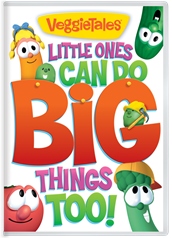 Win It: (1) VeggieTales: Little Ones Can Do Big Things Too DVD to a lucky winner!